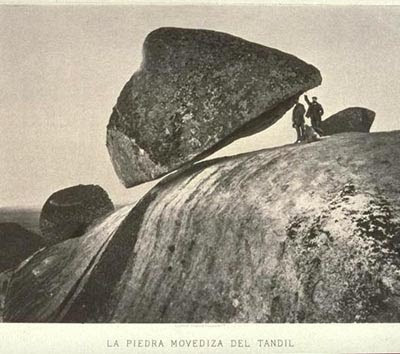 In the region of Tandil in Argentina, there was a huge Rock perfectly balanced on the edge of a cliff, which was a tourist attraction back then. Unfortunately, this rock fell apart in 1912 and we only have the photographs of this impressive “moving rock.” In spite of what skeptics say, it’s evident that no force of Nature could have made this rock balance in equilibrium. Interlocutor: The first question I want to ask you, and I want to clarify that this was a question I had scheduled several years ago: Who put in its place to the Famous “Moving Rock of Tandil”? This enormous Rock is considered a mystery of nature and it's a symbol of this city. 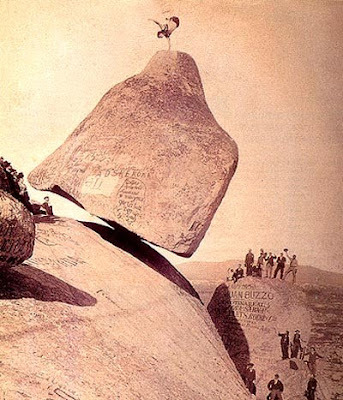 For those who don't know about the topic, Tandil is a city of the county of Buenos Aires (Argentina) that had a humongous rock located on the edge of a cliff, it was a rock that weighted more than 300 tons. This rock was in a precarious balance and it was a routine that people who were visiting the place, put under the rock a bottle to check how the balanced Rock broke it, - it was an almost imperceptible movement - This stone fell apart on February 29, 1912 and nobody could explain the reason. Not very far from that place, there is also an enormous boulder, also on the edge of a hill - it still continues there -.In both cases we know that it is not a whim of nature, but rather somebody did it. Ruanel: The same extraterrestrials that are settled down in the South of Chile did it. Interlocutor: The so-called "Nordics from Friendship Island"? Interlocutor: Were they settled down in that area? Ruanel: Yes, but for a short time. Notice that it’s impossible that nature makes something like that. Thinking in this way for a moment, already reveals a lack of common sense. Interlocutor: I understand. Was there some special reason? I mean, if those stones had some practical use. Ruanel: No, neither of the two stones had a purpose. They simply did it for amusement. Interlocutor: Were there terrestrial inhabitants in that place? Ruanel: Yes, of course, but they were indigenous. Interlocutor: Of what year are we speaking? I mean, the date in which those rocks, the Moving Stone and the Sentry Stone were placed in that region. Ruanel: They were put exactly in the year 992. Interlocutor: And what did the natives say? Did they idolize them? Ruanel: No, they simply thought that they came from the sky. Interlocutor: Were these rocks from the area or they brought them from another place? Ruanel: No, they were in that area, or rather in the mountain-range region. Interlocutor: As I see in this case there is no mystery; Simply, extraterrestrials that were in that place who put those rocks like playing in a given moment, so that the natives get amazed and that’s all. Interlocutor: How did the Moving Rock fall apart? Some theories say that it happened due to the vibration taken place by the explosions of a near mine, and others speculate that somebody, instead of a bottle, put under the rock something more solid and the rock lost its balance. Ruanel: No, none of those things. The rock simply fell apart due to the course of time and its oscillation, the rock eroded the base. Interlocutor: Nobody cast it down? Ruanel: No, it was a natural event. Interlocutor: Is this the whole history? Interlocutor: I presume that these extraterrestrials used anti-gravitational machines. Interlocutor: It's a pity that they could not return the rock to its place again. I know that some attempts have been made, but they failed. Ruanel: It's necessary to make very precise calculations of balance, and for the terrestrials of this time, it’s something impossible to achieve. In addition, it is necessary to have anti-gravitational machines, something that is still very far for human beings. This proves completely that it was not the man the one who put those rocks over there. Interlocutor: In which year did the extraterrestrials arrive to that area? Ruanel: They arrived around the year 915 and they stayed exactly a century because they left in the year 1015 . Interlocutor: Is there something else to add on this? Ruanel: No, there is nothing else that could be important. Interlocutor: Do we give this topic concluded? This entry was posted at Sunday, January 03, 2010 and is filed under Extraterrestrials . You can follow any responses to this entry through the .